The Office of Student Activities, within the Division of Student Affairs, will host the 2014 Student Involvement Fair on the Quad on Wednesday, Sept. 10, from 11:30 to 3 p.m. The event allows registered student organizations the opportunity to showcase their group to the rest of campus and recruit new members. The rain location for the event is Goldstein Auditorium in the Schine Student Center. Students browse the options at tables on the Quad during the 2012 Involvement Fair. Student organizations often use this event to display previous work and to advertise their mission. 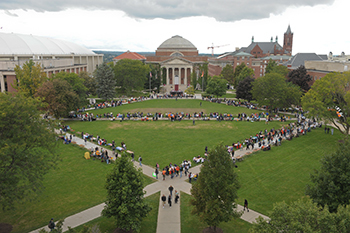 Syracuse University boasts more than 300 active student organizations, ranging from cultural and religious organizations, to campus publications, arts, Greek life, political advocacy groups and more. The complete list can be found at http://syr.orgsync.com/studentorganizations. Through participating in an organization, students gain valuable experience outside of the classroom, developing personal and interpersonal skills, as well as furthering their opportunities to find their social niche on campus. The Office of Student Activities strives to offer students an environment in which they can hone and nurture skill sets that will help them in the future. The fair provides all students with the opportunity to become more involved in campus life. For first-year students, the fair is a chance to engage with other students and find their place on campus. Upper-division students have the opportunity to further explore the diverse number of organizations available to them, to make the most out of their college experience. For more information, contact Sarah Ross Cappella, associate director in the Office of Student Activities, at cappella@syr.edu. Like OSA on Facebook at https://www.facebook.com/SyracuseOSA or follow them on Twitter @SyracuseOSA.